I found this article in the Daily Mail after I was recovering from my operation. Rather apt I think on the day I turn Bionic this article is released holding even more hope for the deaf and hard of hearing in the not so distant future!! 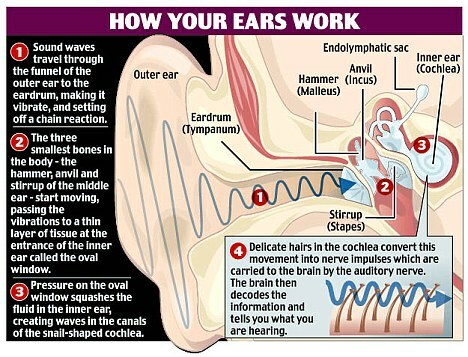 ‘A cure for deafness could be on the horizon after scientists created specialised ear cells in the lab. Grown in their thousands, the delicate hairs could one day be transplanted into the inner ear, restoring hearing to millions. The breakthrough comes after ten years of painstaking research. It may also allow some balance disorders to be eased and aid the search for drugs to prevent people from becoming hard of hearing. Age-related hearing loss affects half of Britons aged 60 and over and there is currently no way of holding it at bay. Hearing aids amplify sounds but nothing can give sufferers back the hearing they once had. In the latest research at Stanford University, California, scientists perfected turning stem cells – blank cells which can turn into other cell types – into the delicate hairs found in the inner ear. ones. The linch-pin of hearing and balance, thousands of these hairs help convert sound vibrations into nerve impulses which are decoded by the brain. Ageing, noise and general wear and tear make them wither away and, until now, there was no way of replacing them. The hairs made in the lab from mice looked and acted like the real thing, the journal Cell reports. Researcher Stefan Heller said: ‘We knew it was really working when we saw them in the electron microscope. If the same technique can be applied to human cells, within ten years it may be possible to transplant-the delicate hairs to restore hearing. Using slivers of the patient’s skin as a source of the stem cells means that any hairs generated would be a perfect match for their body. It also raises the tantalising possibility of creating drugs to coax the ear into growing more hair cells of its own accord. Dr Ralph Holme, of the Royal National Institute for Deaf People, said the news was ‘really exciting’. Yes, stem cells really excite me, I have a blog about it. Feel free to comment and ask questions on as many posts in my blog as you want, all your answers are there.